RoadPilot MicroGo GPS speed camera detector provides spoken voice and visual alerts to speed camera locations in the UK, Eastern and Western European countries. RoadPilot MicroGo directional feature will only warn you of speed cameras that are on your side of the road. MicroGo is also speed sensitive. This means that it won't make an audible alarm if you are travelling below the speed limit. And if you think that's clever, the MicroGo can change the illumination colour of it's screen, so you can match the colour of your vehicle's instruments. RoadPilot MicroGo has been discontinued. Accessories are still available for your MicroGo click here. RoadPilot MicroGo uses GPS technology to provides alerts to speed camera locations and comes ready loaded with RoadPilot's database of speed camera locations and accident black spots in the UK and a large number of Eastern and Western European countries, including Belgium, Denmark, Finland, France, Holland, Italy, Luxemburg, Norway, Poland, Portugal, Romania, Spain, Sweden and the UK. In progress are Germany and Austria. Planned for 2008 additional countries include; Czech Republic, Greece and Solvenia. RoadPilot MicroGo is ready to use - straight from the box. Simply plug the power lead into your lighter socket and you are ready to go. This plug-and-go ability makes it easy to move the microGo from vehicle to vehicle. When you approach a fixed speed camera, RoadPilot microGo gives an audible and visual warning. An "Alert" sound is immediately followed by the words "Speed Camera. Speed Limit 40"... or 50, or 70 etc. 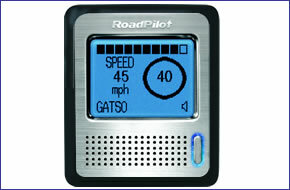 The RoadPilot MicroGo display indicates the permitted speed and your actual speed at the same time. The bar graph indicates how close you are from the speed camera. Audible spoken voice and visual warnings are given if you are exceeding the speed limit. RoadPilot MicroGo uses GPS satellites to calculate your speed over ground with great precision, displayed in mph or km/h (user selectable). In addition RoadPilot MicroGo provides an advance warning when approaching, on the boundary, and while in the Congestion Charge Zone. With 64 colour options to choose from, you can set the RoadPilot MicroGo display's backlight colour to match your car's instrument illumination. You can also set the colour of the visual alerts to change colour when the Roadpilot MicroGo detects a speed camera or when you exceed your personal speed limit. The MicroGo one touch button is also illuminated for ease of use. Time has been kinder to the second Road Pilot, as it still looks modern and, importantly, the price is competitive. Mind you, we don’t like the bracket, which made removing the unit tricky. The short coiled lead would make the MicroGo impossible to use in some cars, too. Despite its small screen, the device had a large speed read-out, showing the limit and countdown blocks with voice warnings, and put in a faultless practical performance. RoadPilot MicroGo is ready to use - straight from the box. Simply plug the power lead into your lighter socket and you are ready to go. The plug-and-go ability makes it easy to move the MicroGo from vehicle to vehicle. The RoadPilot MicroGo comes ready to use right from the box and is pre-loaded with the latest database of fixed speed cameras and accident black spots. RoadPilot MicroGo covers all of the UK speed cameras and a growing number in mainland Europe, countries covered include; Belgium, Denmark, Finland, France, Holland, Italy, Luxemburg, Norway, Poland, Portugal, Romania, Spain, Sweden and the UK. In progress are Germany and Austria. Planned for 2008 additional countries include; Czech Republic, Greece and Solvenia. RoadPilot MicroGo speed camera database updates are free for the first six months. Subsequent speed camera database updates are £49.95 for 1 year or £99.95 for 3 years. In order to update the RoadPilot MicroGo speed camera database you will require a PC running Windows 2000 or XP system software and Internet access. Want to add accessories to your RoadPilot MicroGo? We sell a very limited selection of genuine RoadPilot parts and accessories. ‣Power: 12-24 volt, cigarette lighter.